​Ricochet takes her SURFice dog job very seriously. You will rarely see her smiling on the surfboard. ​The best representation of this is a short, slow motion video that shows 8 year old West who has autism. They both jumped off the board as it neared shore. ​Ricochet didn't take her eyes of him until he made eye contact with her. Even though it was just a second of eye contact, she was assured that he was fine. Then, and only then did she run off to the beach. I believe Ricochet feels a sense of responsibility to those she is working with. In her sensitive, nurturing mind, she doesn't think service members should put themselves in a position to exacerbate pain or emotions. She doesn’t want a person going into environments that would increase their anxiety. She tries to stop them from doing things she thinks can be harmful based on the emotions or pain she’s feeling from them. Ricochet is a certified goal-directed therapy dog with Paws'itive Teams and Naval Medical Center San Diego's canine therapy program. 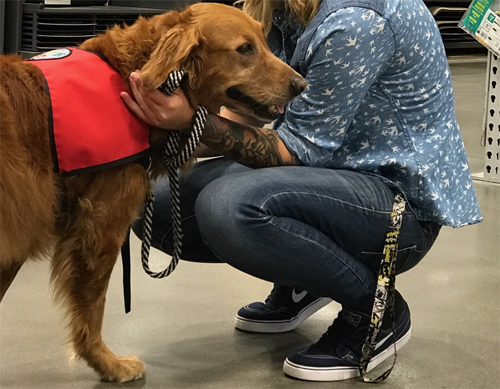 Over a six week period, active duty service members with PTSD handle our therapy dogs while re-entering the community for two hours at a time. The locations are dog friendly, or special permission is given by business owners. ​In this video, Ricochet doesn't want the service member to go up the steps due to health issues. She was fine walking with me until we got to the stairs. Then, she planted. She realized the service member was with us. I let go of her leash, and the service member took it. Ricochet walked up one landing with her, but was moving her toward the wall. Probably for support. But then, when the service member was ready to go another flight, Ricochet refused to go with her. I suggested the service member walk to the top of the stairs and sit down. Watch what happened. ​In this video Ricochet doesn't want the service member exerting herself because she has health issues. You'll see Ricochet steering the service member to a bench, to walk close to a wall, to stop and rest... all in an effort to ensure the service member doesn't do too much. THE VIDEOS ABOVE ARE NOT WHAT YOU WANT A SERVICE DOG TO DO! Intelligent disobedience is when a dog deliberately disobeys a cue from his handler, if it would put them in harm's way. Guide dogs are taught this quality so they can make better decisions for their owners when the need arises. This requires a judgement call on the dog's part in a critical situation. This behavior is a part of the dog's training. For instance, when a blind person listens for traffic and thinks it's safe to cross the street, he tells his dog to go forward. But a car that wasn't there a second ago, suddenly appears. The dog sees this and refuses to move, thus disobeying the handlers request to cross the street. I allow Ricochet to "disobey" because she fills a very specific niche. Her abilities are best suited to service members with PTSD who are just beginning their treatment and recovery process. Many service members are used to "pushing through" and will push themselves to the point of panic attacks, melt downs or worse. Ricochet doesn't let them get to that point. With this service member, Ricochet is adamant about her not doing things... even as simple as walking through Lowe's. In this video, you'll see Ricochet planting, but watch what she does before she plants. She steps in front of the service member and then licks her lips twice. A stress signal in dogs. This subtle behavior, or something just as subtle is what most dogs provide. But, us humans typically miss it, unaware the dog was trying to tell us something. I never really paid attention to the behavior Ricochet was doing just before planting. But she obviously tries to communicate in a subtle way, but when there is no acknowledgement, she says it again, only louder, with planting. Do you believe in fate? Soul mates? Miracles? Divine Intervention? Well, if you read Ricochet's book, you know I do! on Friday, October 10th, she surfed with two boys named Jacob. They are both 19 years old, both have the same heart condition, and both need a life saving heart transplant. Ricochet brought these two critically ill "cosmic cousins" together to surf with her as one perfect heart. ​Yesterday, we went to Lowes. As I suspected, Ricochet didn't want to go in because she intuitively knew the marine was quite anxious (and pregnant). I have never seen Ricochet plant so much. No matter what the marine or I tried, Ricochet wasn't moving. She would look at me with "those eyes" saying we shouldn't be doing this. So, I finally took the leash so we could complete the activity in Lowes. As always, when I took the leash, she didn't plant anymore. When we finished the activity, I told the marine she could take the leash again because now that her mindset had changed and she was walking toward the exit, Ricochet would pick that up, and wouldn't plant. Sure enough... they walked right out with no stopping. Then we went to Ikea. Many service members don't like that store because it's so crowded and there is no clear exit in the departments. But I suggested we go look at the baby stuff and the marine was excited to do that. Because she was distracted from her anxiety with "window shopping", her mindset turned more to exploration than anxiety. Ricochet didn't plant even once in Ikea. Is there something or someone your dog takes responsibility for? Pay close attention to how your dog acts around children in the family. Are they watching the movement of strangers that are near?